I don’t normally do guest posts. This is an exception. My friend Bill wrote this earlier this month after Congress’s effort to pass the most minimal energy legislation collapsed. If you haven’t already read it at TomDispatch or Huffington Post or 350.org, here’s another chance. It’s that important. According to the National Oceanic and Atmospheric Administration, the planet has just come through the warmest decade, the warmest 12 months, the warmest six months, and the warmest April, May, and June on record. A “staggering” new study from Canadian researchers has shown that warmer seawater has reduced phytoplankton, the base of the marine food chain, by 40% since 1950. Nine nations have so far set their all-time temperature records in 2010, including Russia (111 degrees), Niger (118), Sudan (121), Saudi Arabia and Iraq (126 apiece), and Pakistan, which also set the new all-time Asia record in May: a hair under 130 degrees. I can turn my oven to 130 degrees. And then, in late July, the U.S. Senate decided to do exactly nothing about climate change. They didn’t do less than they could have — they did nothing, preserving a perfect two-decade bipartisan record of no action. Senate majority leader Harry Reid decided not even to schedule a vote on legislation that would have capped carbon emissions. I wrote the first book for a general audience on global warming back in 1989, and I’ve spent the subsequent 21 years working on the issue. I’m a mild-mannered guy, a Methodist Sunday School teacher. Not quick to anger. So what I want to say is: this is fucked up. The time has come to get mad, and then to get busy. For many years, the lobbying fight for climate legislation on Capitol Hill has been led by a collection of the most corporate and moderate environmental groups, outfits like the Environmental Defense Fund. We owe them a great debt, and not just for their hard work. We owe them a debt because they did everything the way you’re supposed to: they wore nice clothes, lobbied tirelessly, and compromised at every turn. ROBERT DUDLEY: …The blowout preventers are something that are used on oil and gas wells all over the world, every well. They just are designed not to fail with multiple failsafe systems. That has failed. So, we have a crisis. …JEFFREY BROWN: Excuse me, but the — the technology — the unexpected happened. And so the question that you keep hearing over and over again is, why wasn’t there a plan for a worst-case scenario, which appears to have happened? ROBERT DUDLEY: Blowout preventers are designed not to fail. They have connections with the rig that can close them. When there’s a disconnection with the rig, they close, and they’re also designed to be able to manually go down with robots and intervene and close them. Those three steps, for whatever reason, failed in this case. It’s unprecedented. We need to understand why and how that happened. The failsafe failed. It always does. “Designed not to fail” can never mean “certain not to fail.” There is no such thing as “failsafe” — just different degrees of risk management, different choices about how much money to spend to reduce the likelihood of disaster, which can never entirely be eliminated. Two different social attitudes conspire to lead us to disasters like the Gulf spill. On the one hand, there is the understandable but naive demand on the part of the public and its proxies in the media for certainty: How can we be sure that this never happens again? Sorry, we can’t. If we want to drill for oil we should assume that there will be spills. If we don’t like spills, we should figure out other ways to supply our energy. On the other side, there is what I’d call the arrogance of the engineering mindset: the willingness to push limits — to drill deeper, to dam higher — with a certain reckless confidence that our imperfect minds and hands can handle whatever failures they cause. Put these two together and you have, rather than any sort of “failsafe,” a dynamic of guaranteed failure. The public demands the impossibility of “failsafe” systems; the engineers claim to provide them; and everything is great until the inevitable failure. Each new failure inspires the engineers to redouble their efforts to achieve the elusive failsafe solution, which lulls the public into thinking that there will never be another disaster, until there is. I wrote about these issues as they relate to software in Dreaming in Code. But at some point the need to understand this cycle demands a more artistic response. May I suggest you give a listen to Frank Black’s “St. Francis Dam Disaster,” a great modern folksong about a colossal engineering failure of a different era. The thing about writing a book is — pardon the obviousness — you have to write a whole lot of words. 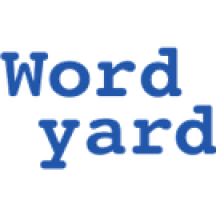 Now, plenty of bloggers do lots of writing, over a period of six months or a year they might easily reach the 80-100,000 word sum of a typical book. There are two big differences for the author of a book: First, you’ve got to write according to a plan, so that the little bricks of words you are piling up form something coherent and shapely, whereas bloggers win a free pass to be discursive each time they hit “post.” Second, bloggers’ work is fueled by a daily reward of feedback and reaction to their posts, whether it’s an onslaught of comments or just a small jump on the site-traffic meter. Authors don’t get that. That is why, so often, we devise systems of our own — tracking systems to help keep ourselves on plan, to know whether we’re ahead or behind, and personal reward mechanisms, to provide incentives across arduous weeks and months. My tracking system is simple: a small spreadsheet with word-count quotas and tallies. I don’t really need to do this, but the ritual of recording each day’s verbal production keeps me moving. The reward mechanism is even simpler. I have a taste for red licorice. 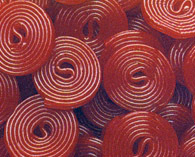 I grew up loving an odd Danish confection called Broadway Licorice Rolls — you got four little rolls of tape-like shapes in a plastic foil wrapping from the candy-store counter. Far as I can tell, they no longer exist. (A brand called Delfa Rolls was distributed online until recently, but is now marked discontinued.) The closest substitute I have found is Haribo red licorice wheels. I buy them in bulk and dump a big bag in a candy jar in my office. When I’m writing a book, each day after I’ve drafted my target amount of prose — usually 1000 words, sometimes more if I’m behind — I mark the occasion with one or two of these fragrant corn-syrup-solid bonbons. Now, I know what you’re thinking; or rather, I know there are two groups of you out there. One group is snorting with derision at this crude methodology — self-doping with sugar! All I can say to them is, you do whatever it takes to get the job done. The other bunch is thinking, “How do you avoid stuffing your face every time you hit a rough spot?” All I can say to them is, that would feel like cheating at solitaire. Maybe I scored when they passed out the genes for delayed gratification. On yesterday’s Fresh Air the science writer Jonah Lehrer was describing a bit of brain research that he discusses in his new book How We Decide. Test subjects divided into two groups were asked to memorize numbers. One group was assigned two digit numbers, the other seven digit figures. Then the members of each group were offered a choice between some sort of gooey, fatty dessert and an austere fruit salad. Of course the seven-digit crew opted much more heavily for the junk food than the double-digit gang. Maybe so. Lehrer has read the study and I haven’t. I only know that as I heard him describe the experiment, and before he offered his interpretation, I sat there and thought: of course the seven-digit people went for the sugar. They’d been asked to do something hard! Now they were rewarding themselves. Plucking one early weed from a bed of germinating seeds changes everything. Small actions by focused participants change the tone of the whole. It is possible to maintain big healthy gardens online. The solution isn’t cheap, or easy, or hands-free. Few things of value are. This isn’t exactly news; the gardening metaphor as applied to online conversation has a long history stretching back to the early days of the Well (and probably Usenet as well) and extending more recently into communities like Flickr and Wikipedia. But each new generation of online services needs to learn this lesson through experience; BoingBoing has managed it well. I believe that attention is the most powerful tool of the human spirit and that we can enhance or augment our attention with practices like meditation and exercise, diffuse it with technologies like email and Blackberries, or alter it with pharmaceuticals. But lately I have observed that the way in which many of us interact with our personal technologies makes it impossible to use this extraordinary tool of attention to our advantage. In observing others — in their offices, their homes, at cafes — the vast majority of people hold their breath especially when they first begin responding to email. On cell phones, especially when talking and walking, people tend to hyper-ventilate or over-breathe. It’s not Hu Jintao who is deluded in believing that the net might serve as a powerful tool for central control. It is those who assume otherwise. I used to count myself among them. But I’ve changed my mind. Kai Krause, who created software tools for designers that were hugely popular a decade or so ago, writes about the frustrating ephemerality of creativity in the software field. I used to think “Software Design” is an art form. Software is merely a performance art! Learning about the real world has obvious evolutionary advantages and kids do it better than anyone else. But why spend so much time thinking about wildly, flagrantly unreal worlds? The mystery about pretend play is connected to a mystery about adult humans – especially vivid for an English professor’s daughter like me. Why do we love obviously false plays and novels and movies? …In fact, I think now that the two abilities — finding the truth about the world and creating new worlds — are two sides of the same coins. Theories, in science or childhood, don’t just tell us what’s true — they tell us what’s possible, and they tell us how to get to those possibilities from where we are now. When children learn and when they pretend they use their knowledge of the world to create new possibilities. So do we whether we are doing science or writing novels. I don’t think anymore that Science and Fiction are just both Good Things that complement each other. I think they are, quite literally, the same thing. A fine insight — one that generations of readers of science fiction and fantasy know in their bones already. Jeff Jarvis reminds us that Moore’s Law is not: “Chips double in speed every 18 months.” Gordon Moore first predicted that the power of microprocessors (as measured by the number of transistors you could cram into a particular space on a chip) would double once every year; later he revised it to once every two years. Somehow — most likely, thanks to careless popular journalism — in the popular imagination this has become set in stone as an every-18-month prediction about chip speed. So I raise again the question of how we can better map content and corrections. How does Moore assure there is a definitive statement of his law? How do we know it comes from him? Once it’s acknowledged as correct, how do we notify those who got it wrong so the can correct it and start spreading the right meme? Truth is a game of wack-a-mole. I’ve been playing that game for a decade. Here’s a Salon column from October 1997 that addresses it. Here’s a post from just this past spring. Here’s two pointers for good reference information on Moore’s Law: one from Greg Papadopoulos at Sun and the other from ExtremeTech. If we all keep repeatedly linking to the good information maybe we can demonstrate that Gresham’s Law does not apply to information, and that good info can drive out bad. But, you know, I won’t hold my breath. Why do some software projects sail to completion while so many others seem cursed? Why must software development be so difficult to plan? These questions should concern everyone interested in science, not just programmers, because computer code is increasingly the language we use to describe and explore the dynamic aspects of reality that are too complicated to solve with equations. A comprehensive model of a biological cell, for instance, could lead to major new insights in biology and drug design. But how will we ever make such a model if the engineering of a straightforward thing like a personal productivity package confounds us? In the heart of the piece, Lanier explains, more fully, his big idea — “phenotropics”: a software system, inspired by biology and robotics, in which surfaces “read” each other using fuzzy pattern recognition, allowing for systems that are better able to handle small variations from the norm without crashing. Suppose software could be made of modules that were responsible for identifying each other with pattern recognition. Then, perhaps, you could build a large software system that wouldn’t be vulnerable to endless unpredictable logic errors. He mentions Web 2.0-style mashups as one fledgling step in this direction, and also provides an anecdotal account of a project from the 1980s that he collaborated on with Andy Hertzfeld (another central figure in Dreaming in Code) called Embrace. It’s a mind-expanding read, like so much of Jaron’s stuff. Embrace surfaces! Find patterns! Friday’s Wall Street Journal included a book review of Almost Human: Making Robots Think, a new book by Lee Gutkind that’s a portrait of the work at Carnegie Mellon’s Robotics Institute. Mr. Gutkind’s second big insight involves Carnegie-Mellon’s approach to project management. It’s awful. Goals aren’t defined. Interim deadlines aren’t met. Crucial subsystems turn out to be incompatible. People rely on all-nighters to get everything finished. Such bad habits invite catastrophic blunders by exhausted people whose last-minute “fixes” snarl everything else. In the most maddening breakdown of all, the scientists devising research projects seldom communicate well with the engineers trying to build them. Even the word “target” becomes a sore spot. To scientists, it means their working hypothesis. To engineers, it means the robot’s physical destination. Unaware of this gap, supposed colleagues get mired in confusing conversations. Gutkind’s book is now on my “must read” list. One final irony to me, coming out of Dreaming in Code, is that Carnegie Mellon is not only home to Gutkind’s roboticists; it also harbors the Software Engineering Institute, which is ground zero for the CMM, CMMI, TSP and other acronymic attempts to add a framework of engineering rigor around the maddeningly difficult enterprise of producing new software. I might be jumping the gun (not having read Gutkind’s book yet), but it sounds like those roboticists and the SEI people should have lunch some time. Biotech is not a field I’ve immersed myself in, and I have been — like, perhaps, many of you — content to place a simple boundary on my worries about its impact, on the assumption that smart and dedicated people were already deeply engaged in assessing and managing the risks we are taking in that area. Then I read Denise Caruso’s eye-opening new book, Intervention, and realized that such complacency is a very bad bet. Intervention is a passionately argued, carefully documented critique of our society’s narrow approach to defining, and dismissing, the potential risks of biotech products. You spent years writing about the technology industry. How did this book come about? It was sheerly out of reaction to meeting [molecular biologist] Roger Brent. He laughs when I say this, and I say it with all the love in my heart, but he’s one of the most macho scientists I’ve ever met in my life. His lineage — in academics, that means who your Ph.D. advisor was — is a guy named Mark Ptashne, whose Ph.D. advisor was James Watson. When I met Roger, his attitude was: What’s a nice girl like you doing being afraid of eating genetically modified food? Don’t you know that you could eat 10 kilos of Bt potatoes [Bacillus thuringiensis is used to modify crops transgenically for insect resistance], and nothing would happen to you? I’ve been hit with the accursed virus that’s going around — not a computer bug; the sniffly, rhinovirus sort. Meanwhile, I’m working my way through Don Knuth’s “Structured Programming with go to Statements”; the Code Reads for that should be up within a day or two. In the political world, I keep returning to the condescending fuss the GOP made before the election about Nancy Pelosi having already begun to choose her new drapes. President Bush followed up with more in his “we took a thumpin'” press conference. And all I can think is, drapes? This election was all about pulling back drapes. Bush’s Washington has been a place of closed curtains and shut doors — from the Cheney energy panel to the secret rendition of prisoners to the zipped-up treatment of the press. Pelosi could mint some appropriate symbolism by simply leaving her windows uncovered. Whether she does so or not, let’s hope for a little more sunshine on the workings of government now that we’re no longer a one-party state. If politics is too mundane and Iraq too depressing, go read Gary Wolf‘s wonderful Wired essay on atheism. It’s a great tour of the subject with stops at the doors of Richard Dawkins, Sam Harris and Daniel Dennett. Wolf concludes that, although atheism is the logical and philosophically sound stance for a scientific person, there’s something off-puttingly evangelical about its most fervent advocates, and that’s why the great bulk of us non-believers tend to identify as agnostics instead. Stem cells: Bush’s shameful first veto? President Bush appears poised for the first veto of his presidency. The cause that has finally pushed him to reject Congressional legislation? An attempt to expand funding for stem cell research that Bush hobbled back in 2001. For millions of Americans, the potential fruits of stem cell research — in the form of cures to dangerous diseases — are a serious matter with grave personal import. For President Bush, the issue has always served as a political football. On the one hand, Bush argues that the destruction of human embryos (microscopic organisms made up of a few cells) is a kind of killing. His press spokesman, Tony Snow, adopting the supercharged cant of anti-abortion activists, referred to it recently as “murder.” In order to stop such “murder,” Bush agreed in 2001 to limit all federal funding of stem cell research to a handful of pre-existing “lines” of cells — cells that had been created specifically for research. His argument was, let’s not use tax dollars to pay for the destruction of more embryos for the sake of research. Here is why Bush’s position is a joke: Thousands and thousands of embryos are destroyed every year in fertility clinics. They are created in petri dishes as part of fertility treatments like IVF; then they are discarded. If Bush and his administration truly believe that destroying an embryo is a kind of murder, they shouldn’t be wasting their time arguing about research funding: They should immediately shut down every fertility clinic in the country, arrest the doctors and staff who operate them, and charge all the wannabe parents who have been wantonly slaughtering legions of the unborn. But of course they’ll never do such a thing. (Nor, to be absolutely clear, do I think they should.) Bush could not care less about this issue except as far as it helps burnish his pro-life credentials among his “base.” This has been true since the first airing of Bush’s position in 2001, as I said back then. So he finds a purely symbolic way of taking a stand, but won’t follow the logic of his position to the place where it might cause him any political harm — as opposing the family-building dreams of millions of middle-class Americans would doubtless do. If Bush believes destroying embryos is murder, let him take a real stand against it. If he doesn’t, he shouldn’t make it harder for the thousands of embryos that are being discarded anyway to be used for a valuable purpose that could improve real lives. That’s why Bush’s stem cell position isn’t Solomonic — it’s craven. His upcoming veto is an act not of moral leadership but of hypocrisy. And the cost of this hypocrisy, assuming Congress can’t muster the votes for an override, will be borne by everyone who dreams of new cures for awful illnesses.